The Ojibwa people lived on the Atlantic Ocean. They decided to move towards the west. They traveled all over Canada.In 1641 they finely arrived into the northern Great Lake region. They lived in the present-day cities of Duluth, Minnesota; Milwaukee, Wisconsin; and Mt. Pleasant, Michigan. Their new land was covered with trees. In most of the region, they grew only a small amount of vegetables.The land was not thick enough in the Summer to farm. That's why they didn't grow a lot of vegetables. The Sioux Indians lived on the Great Plains. 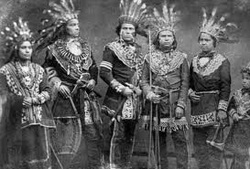 The Sioux Indians belonged to several different groups: the Lakota, Nakota, and Dakota. Now, many Sioux Indians live in several Midwestern sates. They lived in South Dakota, North Dakota, Minnesota, and Nebraska. Urban Sioux Indians take part of the Native American cultural activities at urban social centers. The French were the first Europeans to come into the Midwest states. The Europeans hunted for fur. The Europeans made coats and hats from the fur they got. In 1673, a French priest and explorer named Jacques Marquette and a French Canadian, Louis Jolliet, explored land of the Midwest. They traveled together in Birchbark Canoes from Michilimackinac in present-gay Michigan, across Lake Michigan, and down river to the Mississippi River. On their return journey, they followed the Illinois to a place near present-day Chicago. Jolliet continued on his journey to Sault Sainte Marie,Michigan. 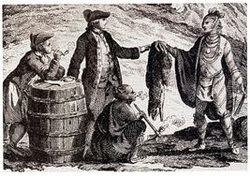 The French kept trading fur where Marquette and Jolliet traveled on their journey. The Native Americans settled in Wapello County, Iowa. They hunted bison, or buffalo. In the 1800s years of suffering had made the Native Americans very weak. 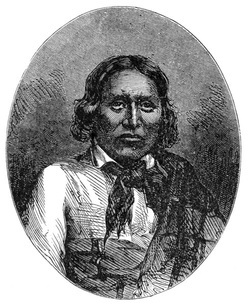 The United States forced the Native Americans to sell their land to the government and move to other places in the Midwest. Most Farmers raised cattle, pigs, and chickens. If the farmers lived near the Mississippi river or other big lakes the could ship their products to the Southeast and the Northeast. Meriwether Lewis and William Clark were explorers that Thomas Jefferson set out to explore the land and people of the Midwest. They traveled up the Missouri River and further. He asked Lewis and Meriwether to keep track of where they went. On their journey they met different Native Americans. They had many journeys together. They learned that there were no flowing water routs that connected the Pacific Ocean to the Midwest states.